Coloriasto: Photo-Trichromatic Printing. Part I. Complementary colours. Photo-Trichromatic Printing. Part I. Complementary colours. 1896Complementary spectrum colours are any two colours which, when combined, will produce white light. This can be brought about by suitable means, such as, for instance. Clerk-Maxwell's colourbox or Captain Abney's colour patch apparatus. Such pairs of complementary colours are purple and green, red and bluish-green, orange and blue, yellow and violet, etc. Such pairs, if combined, produce white light, and are therefore called complementary colours. It may here be stated that the primary colours and their secondaries of the artist's pigment-colours are not really complementary, but "contrast colours." These will be fully dealt with later on. * Dr. D. Fraser Harris on Ives' photochromoscope, in a paper read before the Philosophical Society of Glasgow, Nov. 6th, 1895. *That there are three primary spectrum colours, red, green, and violet, which cannot be produced by any mixture of any other colours. That there are three sets of "end-organs" in the retina of our eyes, one set being powerfully stimulated by red and orange rays, less so by green, and least of all by blue-violet; the second set being especially excited by green light, and less so by the spectral rays on either side of it, i.e., red and violet. The third set are most susceptible to violet light, less so to green, and least of all to red. That by stimulation of all three sets of "end-organs" (rods and cones) in nearly equal intensities we perceive white. The relative power of different spectrum rays to excite the respective fundamental colour sensations is shown by the curves in Koenig's diagram (modified and corrected by Captain Abney), which may be taken as the most correct. 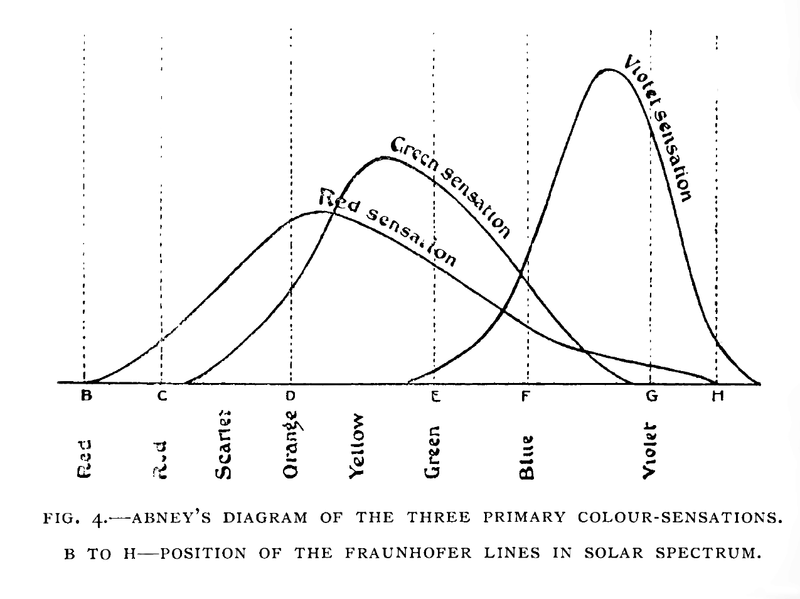 The fundamental green sensation cannot be perceived by the normal eye, but only by red or violet colour-blind people, for the reason that the red and violet sensations overlap in the green of the spectrum, as will be seen in the diagram of Koenig's curves. The colour-tone of the fundamental green sensation as purely as a normal eye can see it, is located between the Fraunhofer lines E and b, and may be taken as the primary green for purposes of colour mixture. The best representation of the fundamental red sensation lies between the lines C and D, nearer the former by two-thirds of the distance, and may approximately be represented by vermilion with a slight tinge of carmine. The best representation of the fundamental violet sensation lies between the G and H lines of the spectrum, and may be represented by deep ultramarine, which has been tinged with methyl violet dye. There are rays beyond the red and beyond the violet end of the visible spectrum. Those beyond the red end, the infra-red rays are caloric or heat rays, given out by heated bodies before they show incandescence, and these can be measured by an instrument called a thermopile. The rays beyond the violet end of the visible spectrum are called the ultra-violet or "actinic" rays. The complete spectrum consists of the invisible infra-red (heat) rays, the visible rays, and the invisible ultra-violet rays. These three parts are of about equal length. To the artist and colour printer however, only the middle, being the visible part, is of value. For the exact definition of a colour, three qualities have to be determined. The qualities are called colour constants, and are the following: — Hue, luminosity and purity. Hue is often called "tone." Hue is what in every day language is called the colour, for instance, scarlet, crimson, violet, etc. For scientific purposes the hue is referred to its proper location in the spectrum. Luminosity means the brightness with which a colour appears to the eye compared with a white surface, which is illuminated simultaneously by the same white light. Purity means the freedom of a colour from admixture with white light. Tints reflect a great proportion of white light, and are diluted or impure colours. Pink is an impure crimson red, lavender is an impure violet. Photo-Trichromatic Printing. Part II. Triads. Photo-Trichromatic Printing. Part I. Chromatics.